So what kind of gun should you buy? That is a great question to ask but is generally hard to answer. Deciding on your first gun is like trying to decide on which new car to buy. You have to consider caliber, features, size and type of gun. How do you plan on carrying your firearm and how often? Have you found a gun range that rents handguns? This is probably a good place to start. Different types of handguns will have different grips and thus feel differently in the hand. Try before you buy if possible. Here are some steps you can follow for selecting a firearm for self-defense carry. Caliber - Identify the caliber you want to employ for self-defense. 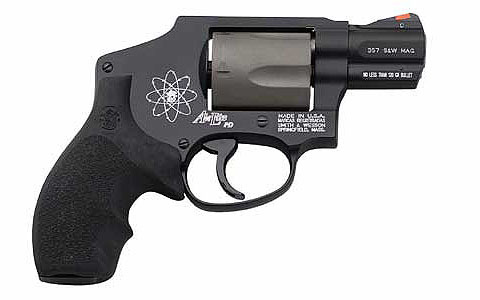 Ideally this will be the largest caliber handgun that you can control safely. Type - Determine if you want a revolver or semi-automatic pistol in your caliber of choice. Beginners seem to be more comfortable with revolvers. Size – Now that you know the type of gun (revolver or semi-auto), match the physical size of the gun to your chosen method of carry and dress. Do you really want to carry a $1,200 dollar gun around for personal protection? High quality guns can be found new for around $500.00. Concealing a handgun is fairly easy in winter (in MN) because of the type of clothing that is worn. In the summer months, shorts and t-shirts are the norm (in many cases). Having a compact .45 on your belt might not work out. Could there ever be an occasion when a situation justified having your hand on your gun with the anticipation of needing to draw? 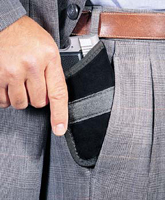 Having a gun on your waist might not allow this to be done discretely without alerting the potential attacker. In short, consider your lifestyle, how you dress and how often you plan to carry a firearm for personal protection. Based on what you decide, your decision should heavily influence the size of the handgun you buy and how you carry the firearm. As far as brand of firearm, I am a firm believer in you get what you pay for. Do some research, ask around then decide. In my opinion, pocket carry is ideal (at least for me). My firearm is small and light and your gun is discretely concealed yet readily available at a moments notice. Pocket carry has advantages. Consider all your options then decide. Like most anything else, your firearm should be cleaned after each use. Lead, copper and powder buildup in the firearm can impact the firearm’s accuracy and reliability, especially with semi-automatics. Revolvers are more forgiving of grime buildup. Cleaning and oiling your firearm helps prevent rust and adds years to the life of your gun. Firearms are not inexpensive so protect your investment and clean your guns after each outing to the gun range. 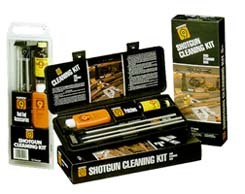 Firearm cleaning supplies will typically include cloth patches, cleaning rod, soft cloth, cleaning rod attachments, small brush, bore cleaner, bore brush and gun oil. Always ensure your firearm is unloaded before cleaning and that you follow the Owner Manual for directions on disassembling and reassembling your firearm. Following directions from the manual will help to prevent damage to your firearm.